Over the course of 10 days in August, the biggest meet of her life ended like pretty much all the others in the four years that came before it: with Biles standing atop the podium, a gold medal around her neck and the sport she's redefining one boundary-pushing routine at a time staring up at her. Not that she remembers any of it. "It's kind of a blur," Biles said. It may be a blur to Biles, but not to the rest of the world. Her massive haul in Rio de Janeiro - a record-tying four golds to go along with a bronze for the dominant U.S. women's team - propelled her to stardom and rendered her last name superfluous. Now there's one more honor to add to what on Twitter is known simply as #SimoneThings: Associated Press Female Athlete of the Year. In a vote by U.S. editors and news directors, Biles received 31 votes out of a possible 59 votes. U.S. Olympic swimmer Katie Ledecky, who won four golds and a silver in Rio, finished second with 20 votes. Serena Williams, who won Wimbledon for the seventh time to tie Steffi Graf's record of 22 Grand Slam titles, and three-time AP women's NCAA basketball Player of the Year Breanna Stewart tied for third with four votes each. Biles became the fifth gymnast to win the honor, joining Olga Korbut in 1972, Nadia Comaneci in 1976, Mary Lou Retton in 1984 and Gabby Douglas in 2012. It's company Biles joined while completing a run of dominance that included three straight all-around World Championships, an unprecedented run at the top in a sport where peaks are often measured in months, not years. Yet Biles seemed immune to it. At least on the outside. Inside, there were more than a few butterflies when she stepped onto the floor during team preliminaries on Aug. 7. They vanished the moment she stepped onto the green and cream colored floor at Rio Olympic Arena as she and the rest of her "Final Five" teammates - Douglas, Aly Raisman, Laurie Hernandez and Madison Kocian - put on a clinic that showcased how substantial the gap between the Americans and the rest of the world has grown. "In prelims, I did very well. 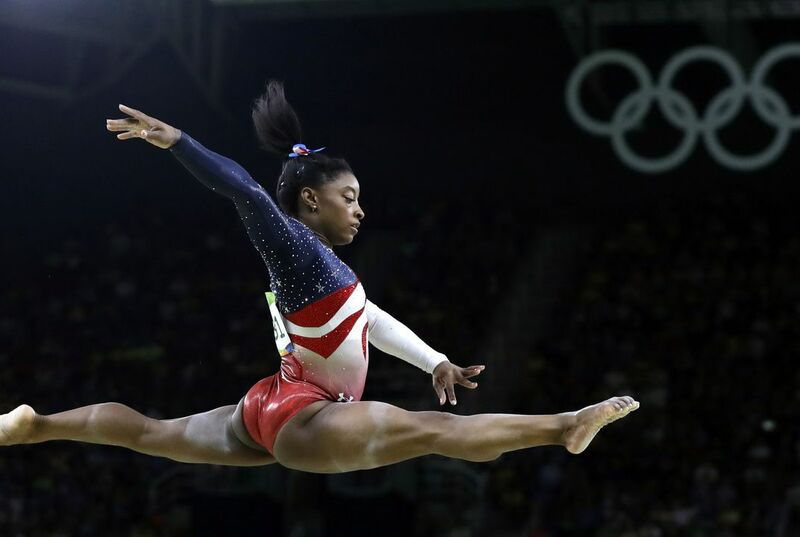 I kind of shocked myself," Biles said. "I came in thinking, 'I've been to three worlds.' I knew the gist of it. Once I got (prelims) out of the way, I just kind of relaxed." What followed was a run of brilliance. There was a team gold as a fitting send-off to retiring national team coordinator Martha Karolyi. Another came in the all-around two days later, where her score of 62.198 bettered Raisman by more than two full points, the gymnastics equivalent of winning a football game by three touchdowns. A third gold came on vault, the first ever by an American woman at the Olympics and Biles' first in major international competition to fill the only hole in her increasingly peerless resume. The ensuing four months have been a whirlwind. Biles carried the U.S. flag at closing ceremonies, published her autobiography, took part in a post-Olympic tour with her teammates (including performing in eight shows despite a fractured rib) and hung out at the White House with the president. She remains open to giving it another Olympic shot in Tokyo in 2020. That's for later. In January she'll sit down and plot out her goals for the upcoming year. For the first time since she can remember, gymnastics won't be on the list. It'll be weird, sure. That's not necessarily a bad thing. "I miss training with the girls and having a good time," Biles said. "Whenever I go to the gym to visit them and I see them, I do not miss this part at all right now." This makes sense to me. She took the world by storm with her athleticism in the gymnastics arena in Rio. If I had the opportunity, I would have voted for her too. 19 year old Simone Biles was recently named the female athlete of the year. Perhaps this was due to Biles' amazing Olympic performance in Rio. The member of the "Final Five" finished with a record tying four gold medals and one bronze. 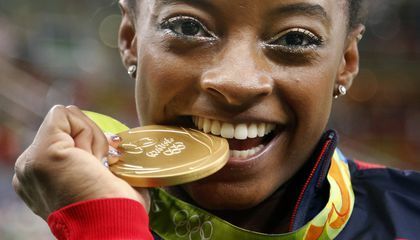 The author meant that everything in gymnastics is still the same and it highlights how Simon Biles is still a remarkable gymnasts and how she has made a legacy to possibly be the best gymnast of all time. She was awarded the Olympic gold after the 10 day event that she explains that she barely remembers. I would definitely have voted for her as well. She took the whole world by surprise at the Olympics and anyone could see how hard she worked. I think that this is a good article because it shows how she tried hard and she got 31 votes out of 59 votes which is a lot. The last person who got that many votes in that range was Gabby Douglas in 2014. She treated the Olympics like any meet that she ever had. It was good a healthy pursuit because she really tied and it was something no one would ever forget. This is so great. Good for her. That's so awesome. Nineteen year old Simone Biles won the Associated Press Female Athlete of the Year because of her Olympic performance this past summer in Rio de Janeiro. She won the award with an impressive 31 votes out of a possible 59, winning by a margin of 11 votes. Biles won this award because of her record-tying Olympic performance of four gold medals and one bronze medal. This separate distinction for females brings more attention toward outstanding female athletes in a world that tends to focus more on math athletics as a whole. I think that as female athletics progresses and talent becomes more multifaceted, further respect will be given toward the athletes who work so hard to achieve success. Additionally, I believe little girls across the world benefit from having positive role models such as Biles which they can use as motivation to succeed. I believe, the author is trying to say that gymnastics is still the same/ordinary sport. But with an amazing athlete of all time,such as Simone Biles makes this ordinary sport comes into light/ view.